So Jess @ Funky Finds and I have been conspiring... and this is the result! We are offering a $25 gift certificate to my shop for the winner of the current giveaway on the Funky Finds site. 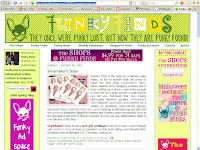 Visit the Funky Finds site for details. All you have to do to qualify is to visit my Etsy shop and return to Funky Finds where you leave a comment about your favorite item in my shop. The giveaway runs from now through January 8 (midnight CST). At the end of that time, Jessica will draw a winner.